For the purpose of instrument flight training, a steep turn is defined as any turn in excess of standard rate. A standard rate turn is defined as 3 degrees per second. The bank angle that equates to a turn rate of 3 degrees per second varies according to airspeed. As airspeed increases, the bank angle must be increased. The exact bank angle that equates to a standard rate turn is unimportant. Normal standard rate turn bank angles range from 10° to 20°. The goal of training in steep turn maneuvers is pilot proficiency in controlling the aircraft with excessive bank angles. Training in excessive bank angles challenges the pilot in honing cross-checking skills and improves altitude control throughout a wider range of flight attitudes. Although the current instrument flight check practical test standards (PTS) do not call for a demonstration of steep turns on the certification check flight, this does not eliminate the need for the instrument pilot-in-training to demonstrate proficiency to an instructor. Training in steep turns teaches the pilot to recognize and to adapt to rapidly changing aerodynamic forces that necessitate an increase in the rate of cross-checking all flight instruments. The procedures for entering, maintaining, and exiting a steep turn are the same as for shallower turns. Proficiency in instrument cross-check and interpretation is increased due to the higher aerodynamic forces and increased speed at which the forces are changing. As soon as the bank angle increases from level flight, the vertical component of lift begins to decrease. If the vertical component of lift is allowed to continue to decrease, a pronounced loss of altitude is indicated on the altimeter along with the VSI tape, as well as the altitude trend indicator. Additionally, the airspeed begins to increase due to the lowered pitch attitude. It is very important to have a comprehensive scan developed prior to training in steep turns. 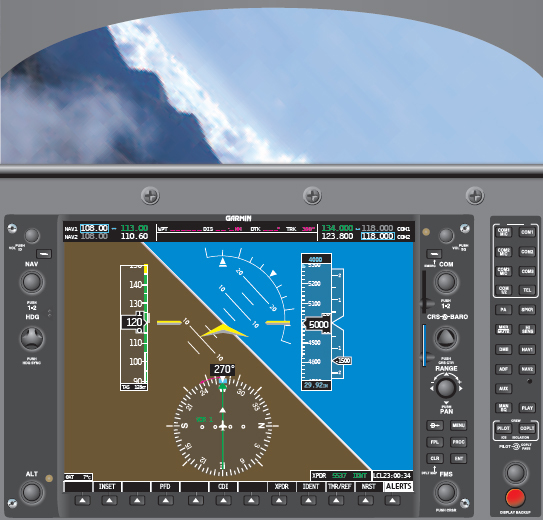 Utilization of all of the trend indicators, as well the VSI, altimeter, and ASI, is essential in learning to fly steep turns by reference to instruments alone. In order to avoid a loss of altitude, the pilot begins to slowly increase back pressure on the control yoke in order to increase the pitch attitude. The pitch change required is usually no more than 3 degrees to 5 degrees, depending on the type of aircraft. As the pilot increases back pressure, the angle of attack increases, thus increasing the vertical component of lift. When a deviation in altitude is indicated, proper control force corrections need to be made. During initial training of steep turns, pilots have a tendency to overbank. Over banking is when the bank angle exceeds 50°. As the outboard wing begins to travel faster through the air, it begins to generate a greater and greater differential in lift compared to the inboard wing. As the bank angle continues to progress more and more steeply past 45°, the two components of lift (vertical and horizontal) become inversely proportionate. Once the angle has exceeded 45°, the horizontal component of lift is now the greater force. If altitude should continue to decrease and the pilot only applies back yoke pressure, the aircraft’s turn radius begins to tighten due to the increased horizontal force. If aft control pressure continues to increase, there comes a point where the loss of the vertical component of lift and aerodynamic wing loading prohibits the nose of the aircraft from being raised. Any increase in pitch only tightens the turning radius. The key to successfully performing a steep turn by reference to instruments alone is the thorough understanding of the aerodynamics involved, as well as a quick and reliable crosscheck. The pilot should utilize the trim to avoid holding control forces for any period of time. With time and practice, a flight instructor can demonstrate how to successfully fly steep turns with and without the use of trim. Once the aircraft is trimmed for the maneuver, accomplishing the maneuver is virtually a hands-off effort. This allows additional time for cross-checking and interpreting the instruments. It is imperative when correcting for a deviation in altitude, that the pilot modify the bank angle ±5° in order to vary the vertical component of lift, not just adjust back pressure. These two actions should be accomplished simultaneously. During the recovery from steep turns to straight-and-level flight, aft control forces must be varied with the power control to arrive back at entry altitude, heading and airspeed. Roll left into a 45° bank turn and immediately begin to increase the pitch attitude by approximately 3° to 5°. As the bank rolls past 30°, increase power to maintain the entry airspeed. Apply trim to eliminate any aft control wheel forces. Begin rolling out of the steep turn approximately 20° prior to the desired heading. Apply forward control pressure and place the pitch attitude in the level cruise pitch attitude. Reduce power to the entry power setting to maintain the desired airspeed. Re-trim the aircraft as soon as practical or continue into a right hand steep turn and continue from step 3. Once the maneuver is complete, establish cruise flight and accomplish all appropriate checklist items.